Nicholas A. Langworthy was unanimously elected as Chairman of the Erie County Republican Committee on May 5, 2010. He was reelected in September 2010, 2012, 2014, 2016, and 2018. First elected at 29 years of age, he is the youngest person ever to be elected Chairman of any Political Party in Erie County. In his tenure as ECGOP Chairman, Langworthy has re-energized and modernized the Republican Party and placed a major emphasis on growing the grassroots of the GOP in the digital age, while sticking to core Republican principles of smaller government, lower taxes and greater personal responsibility. 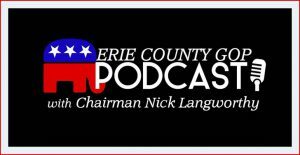 Since Langworthy was elected Chairman, the Republican Party in Erie County has been Growing, Winning and Leading. In 2013, a Republican majority was elected to the Erie County Legislature for the first time in four decades. His era of Party Leadership has led to great victories despite a 2:1 Democratic enrollment advantage in the county. Despite the steep uphill battle, 8 of the last 10 countywide elections have been won by Republican candidates under Nick Langworthy’s leadership including County Comptroller Stefan Mychajliw, and Sheriff Tim Howard. In 2018, his organization successfully returned all three Republican Senators to Albany. Chairman Langworthy continues to grow local Republican representation by recruiting strong, taxpayer-focused candidates to serve at the state, county, town and village levels of government. In recent years, Erie County has become the epicenter of New York State Republican politics. Potential statewide candidates usually make a visit with Langworthy at Erie County Republican Headquarters the first stop of their campaign tours. This has led Buffalo News political reporter Bob McCarthy to nickname Langworthy as “The GOP’s Young Elder” in his weekly column. Langworthy’s influence and leadership in the community have been independently recognized in Buffalo Business First Magazine’s “Power 250” Ranking of Western New York’s most influential people every single year from 2013 to 2019. He also has been included in City and State Magazine’s list of New York State’s “Power 100” and was named one of their “40 under 40” in 2017. Following the election of President Donald J. Trump, Langworthy was named to the executive committee of the transition team in 2016. From a very early age, Langworthy displayed a passion for government and political service. As a student at Niagara University, he founded a chapter of the College Republicans. He went on to travel across the state recruiting students to start campus chapters and to get involved in national, state and local campaigns during his two terms as Chairman of the New York State College Republicans. Prior to his service as Chairman, Langworthy worked on the district staff, then as campaign manager for Congressman Tom Reynolds. Langworthy went on to serve as District Director for Congressman Chris Lee, helping to ensure Western New Yorkers received the effective representation and constituent service they deserve. Langworthy is the President and Founder of Liberty Opinion research, a public polling company dedicated to helping elect Republican candidates around the country. A lifelong Western New Yorker, Langworthy is a 2003 graduate of Niagara University with a Bachelor’s of Arts in Political Science. He is a 1999 graduate of Pine Valley Central School in South Dayton, NY. He and his wife, Erin, reside in Amherst with their daughter, Madeline.